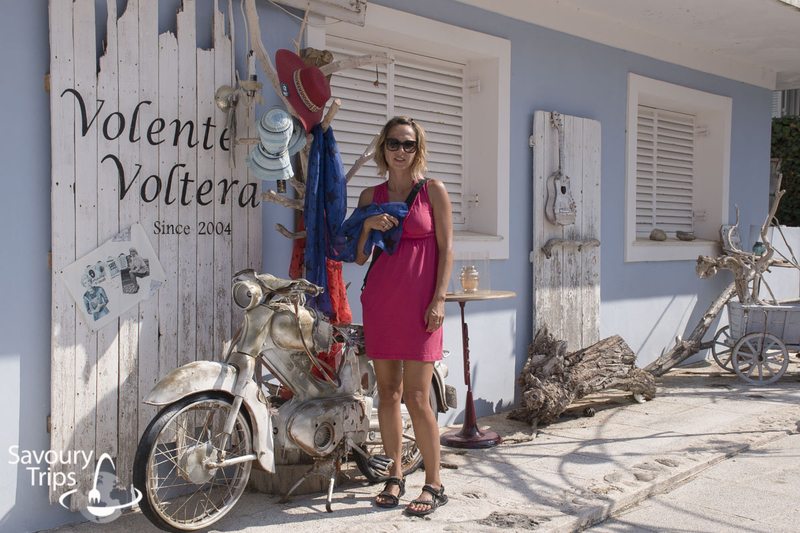 In case you still haven’t read the first part of the ultimate Kefalonia guide, I suggest that you do that now and here so that you have enough time to organize everything before you make the final decision. 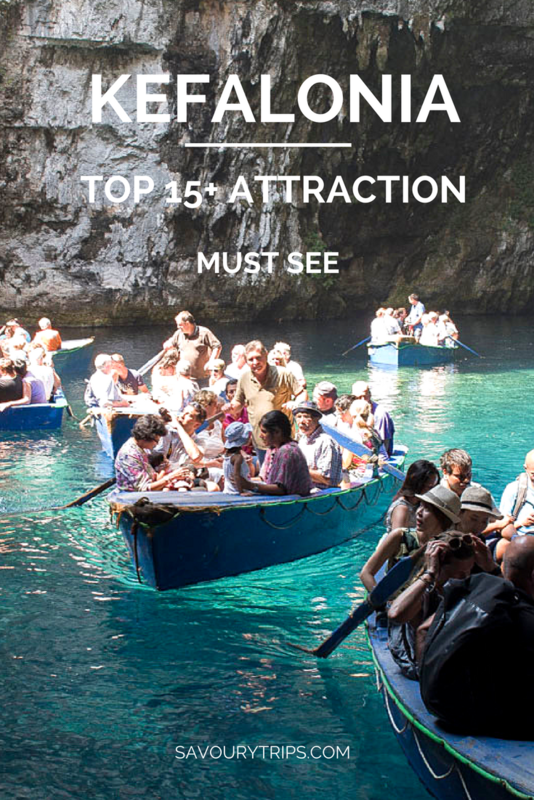 I am happy to recommend you some of the world attractions you can visit on your trip to Greece. 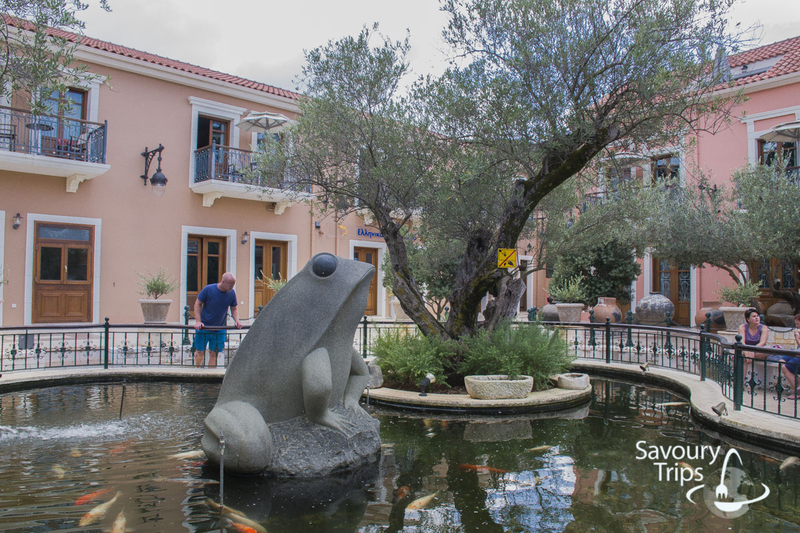 Everything you can see and do in Kefalonia in details, and why it’s such an interesting destination for thousands of tourists. 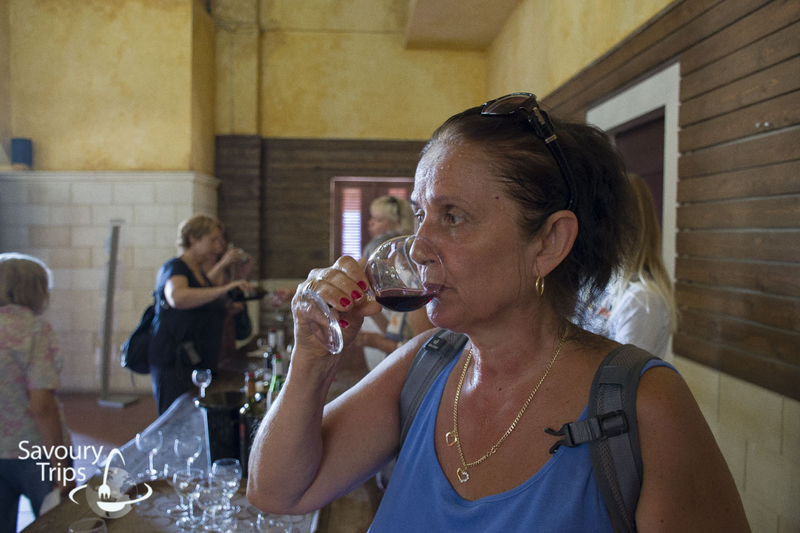 We have already mentioned, it’s best to divide your tours into days and use all the time that’s left to go to the beach, visit cafés and for some other hedonistic things. A small place with lots of sandy beaches and bays. 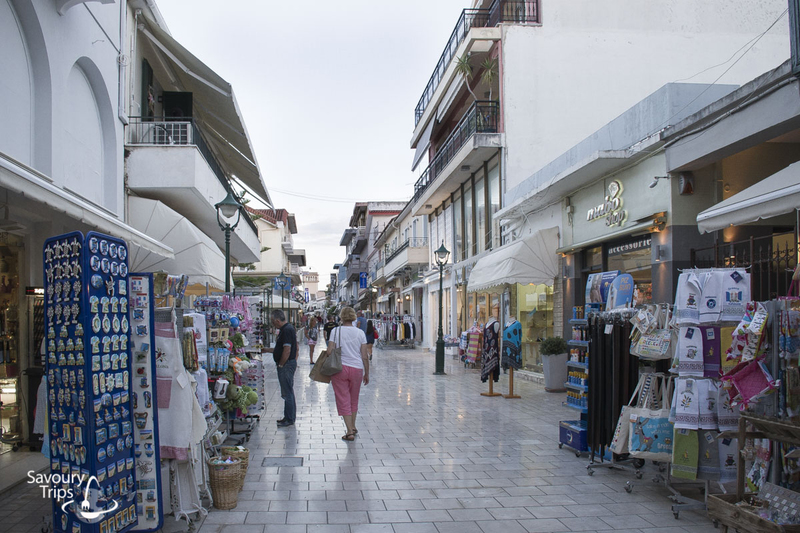 It has one main street in which there is everything, from stores to restaurants. 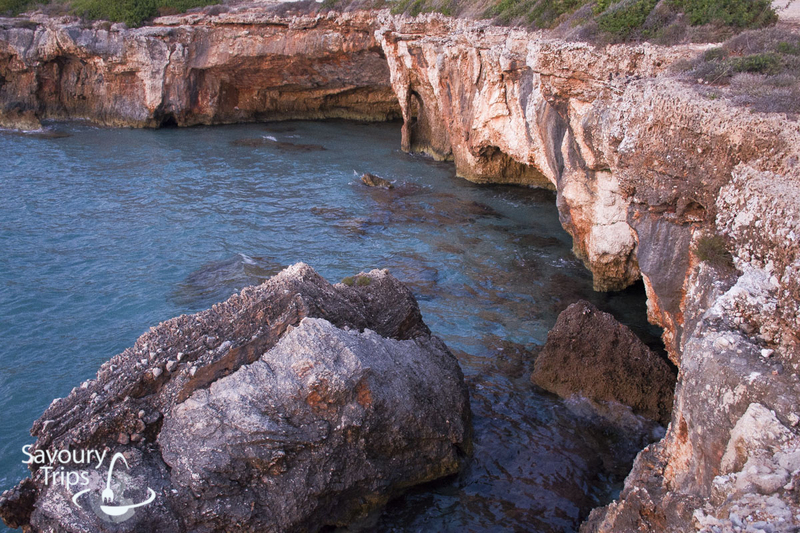 Near one of the beaches in the center of Lassi, there is this natural stone attraction, made by the erosive force of water and waves. A pause to take photos about 10-15 minutes for that, although there is also a small restaurant on the beach. The first one was also built by the English in 1821. 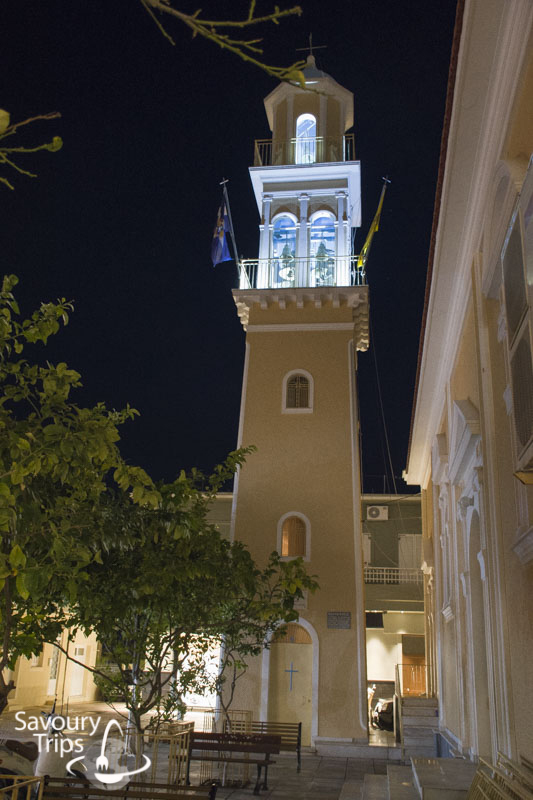 As Kefalonia is a seismic active area susceptible to earthquakes, this lighthouse was destroyed and rebuilt three times. The lighthouse has one romantic feature, it is a meeting spot for couples. Also, the best wedding photos are taken in this very spot. 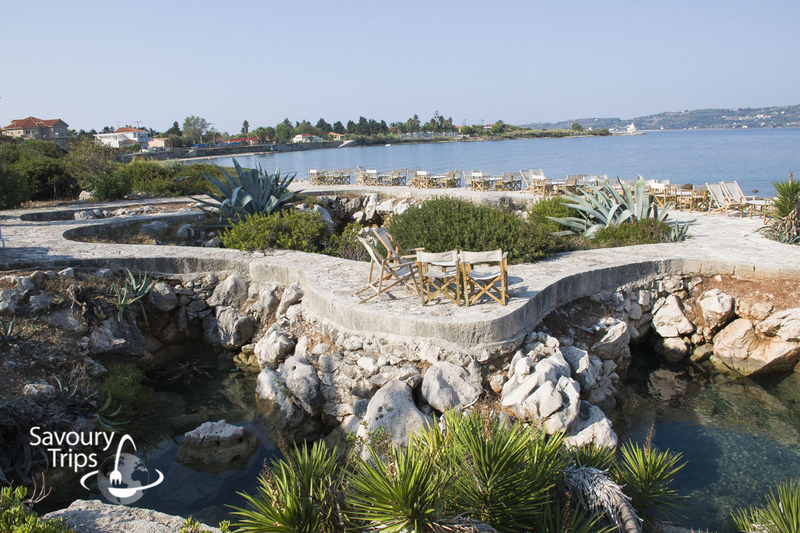 The lighthouse has one romantic feature, it is a meeting spot for couples. Also, the best wedding photos are taken in this very spot. 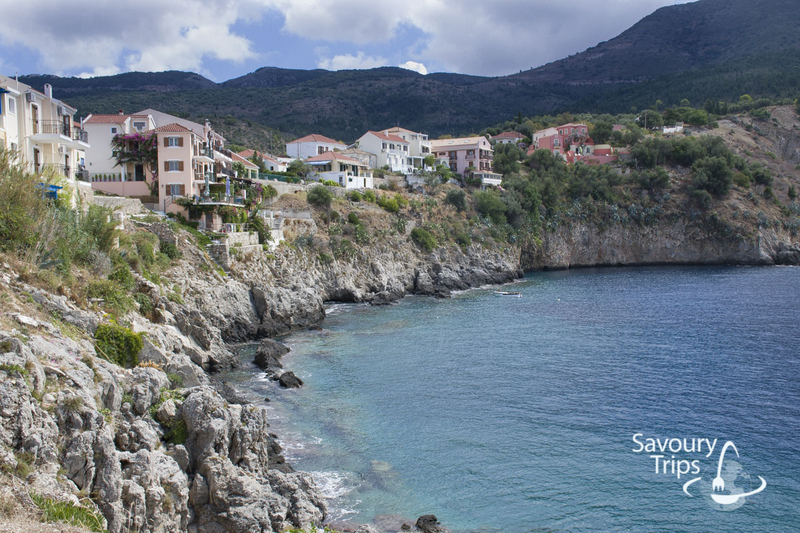 So, Kefalonia is an ideal place for honeymoon, or proposal. 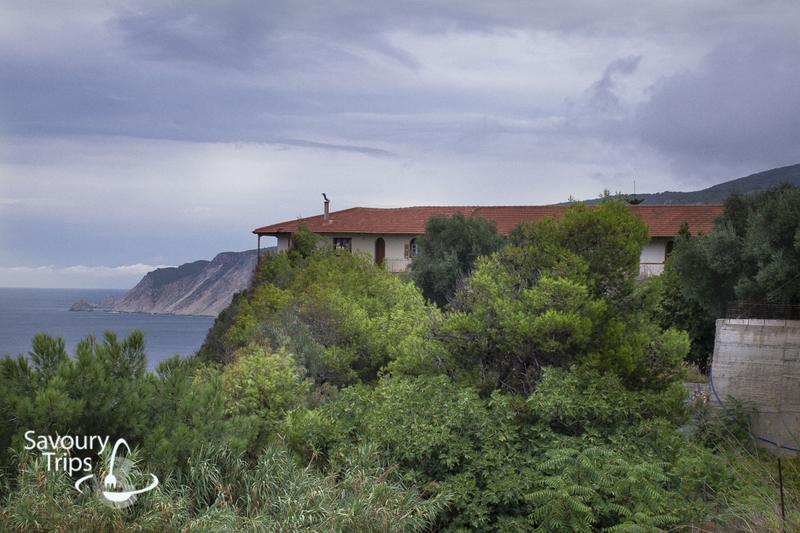 A magnificent view from the lighthouse is stretching over to the biggest city, Lixouri, which is on the other shore. It takes 15 minutes to take photos and see all this. 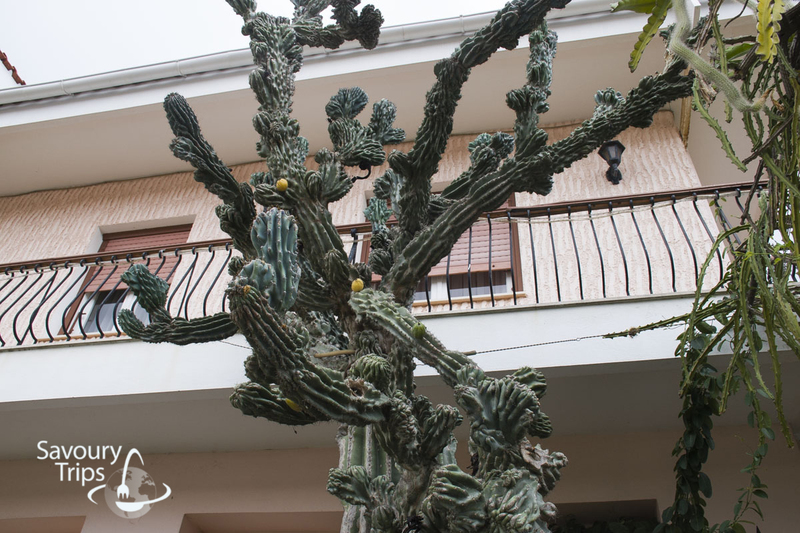 A natural phenomenon which is not far from the lighthouse. Where the sea water disappeared and left that place was an unsolved mystery for hundreds of years. 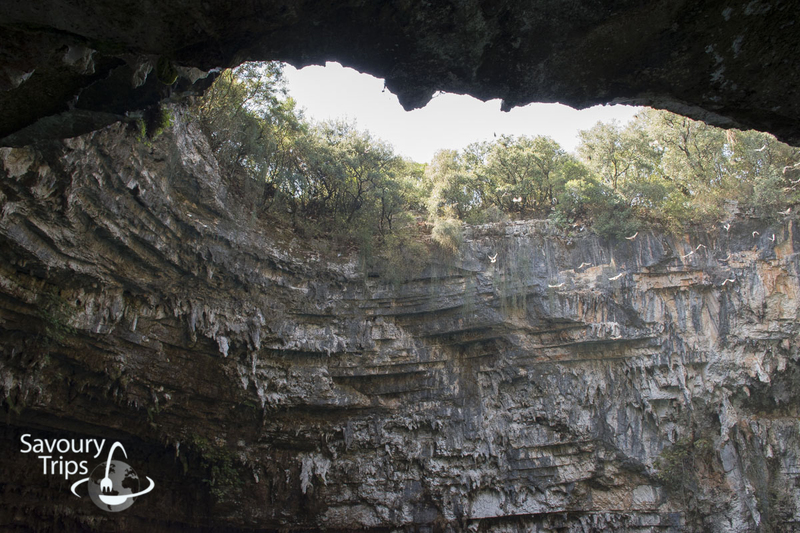 It wasn’t until recently that it was discovered the water created a circle underneath the island all the way to the Melissani lake. A nice place for a morning coffee and an opportunity to take a couple of photos as a memory, so you don’t need to spend more than 20 minutes there. This place was booked for my morning coffee 🙂 . 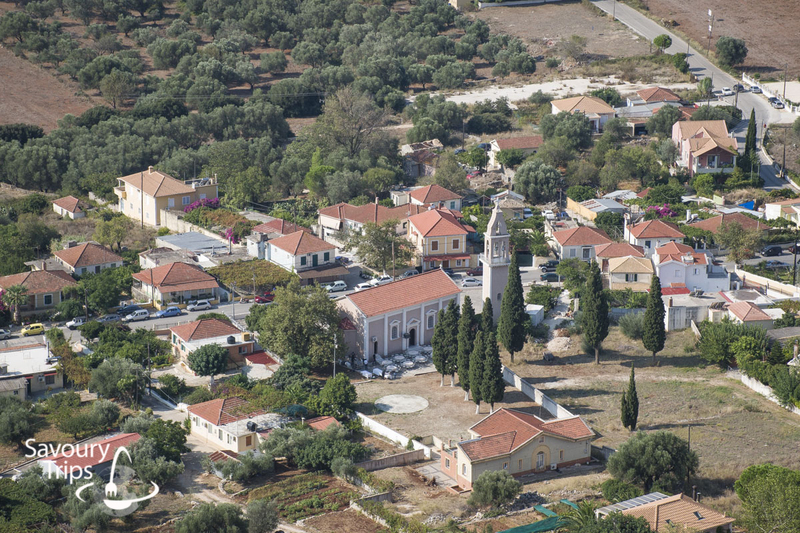 The biggest city, and the capital of Kefalonia. 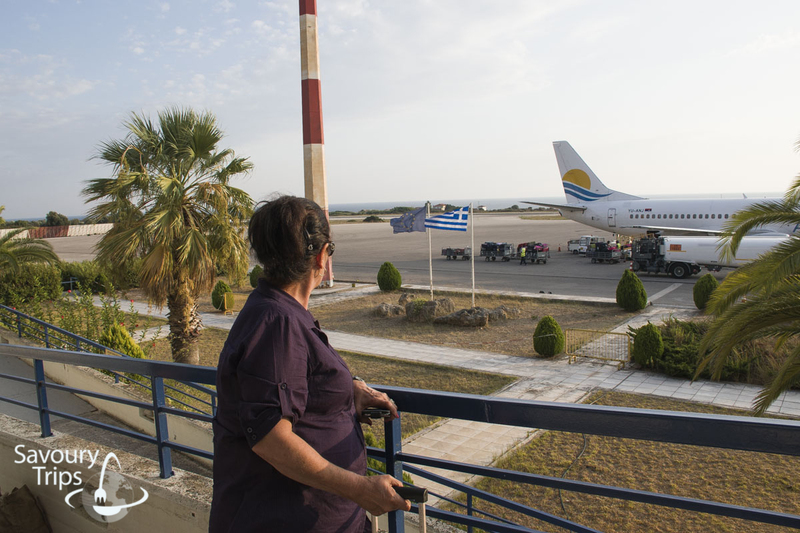 Although I was accommodated in Lassi, we walked for 5 km in one direction almost every night to Argostoli. You can go shopping there, as well as eat some great food because there is a great choice of restaurants and cafés. You should also visit the Museum of archaeology. There is a beautiful promenade along the shore where you can sit in the evening and look at the beautiful sky full of stars. And I am yet about to show you what the sunset in Kefalonia looks like. And I am yet about to show you what the sunset in Kefalonia looks like. 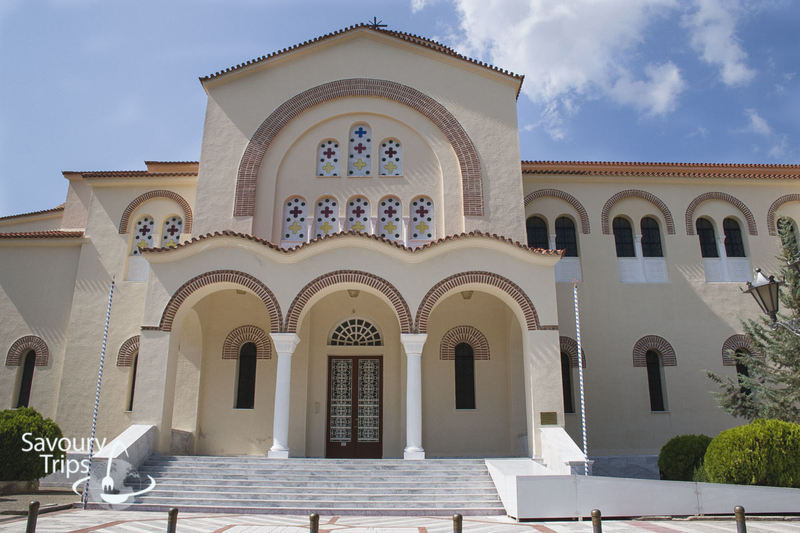 You can also visit the Orthodox Greek church in the center of the city, pedestrian zone. Breathtaking Drapano bridge, built by the English, connecting the two shores. It’s not very short but is an amusing experience to walk across it. 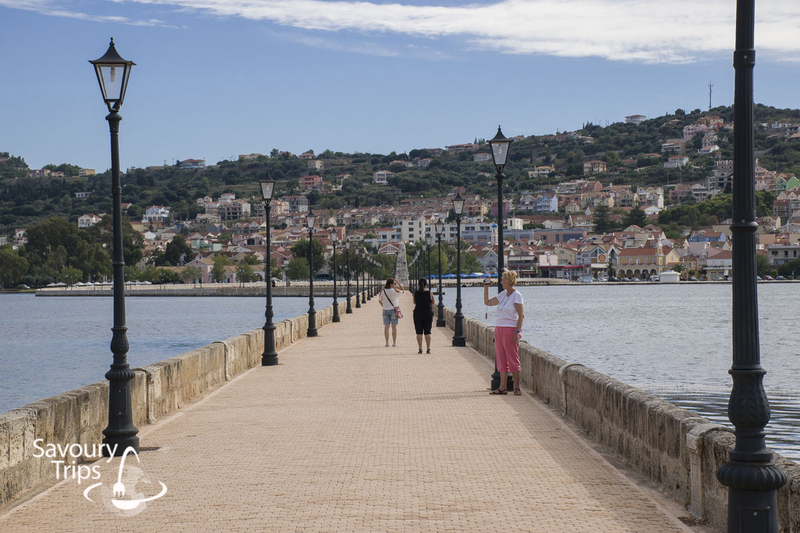 In Argostoli, if you are early enough and with some luck, you can also run into some turtles along the shore on the beach. 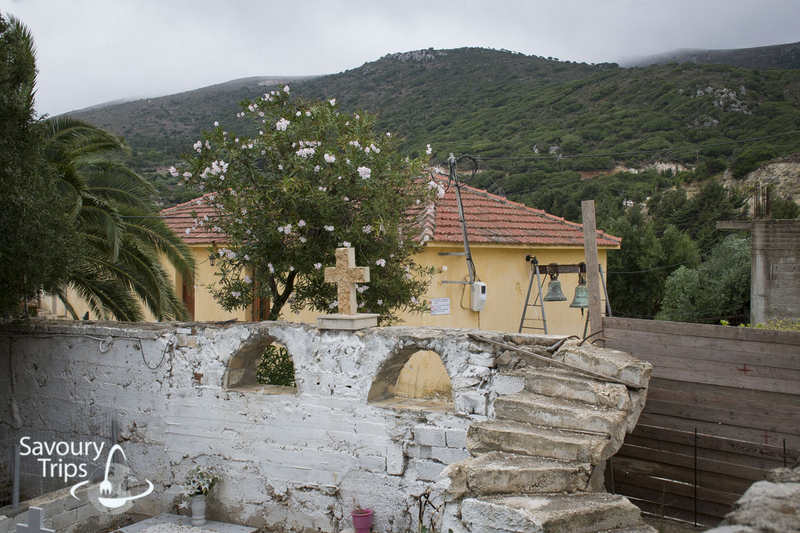 A small village in hills which was ruined in the biggest earthquake ever to hit Kefalonia, in 1953. 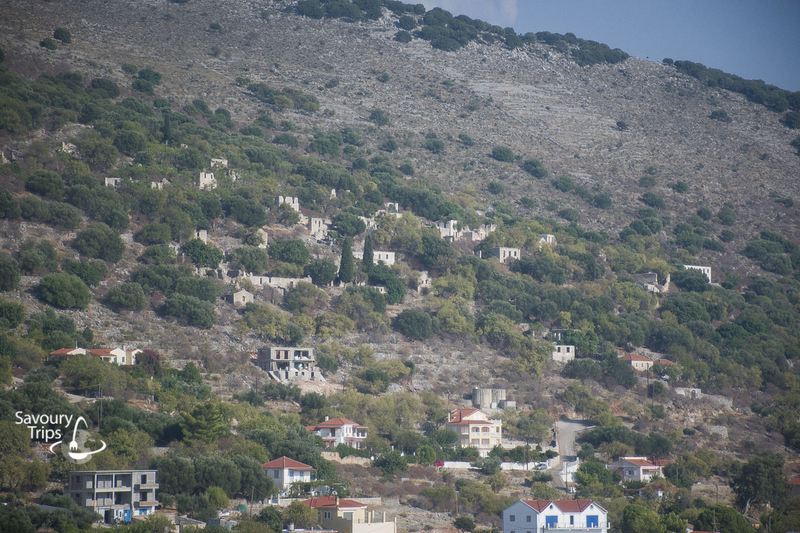 All of the houses were completely ruined, so that the settlers didn’t try to fix them, but built new ones closer to the shore (compare the top and the bottom picture). After that earthquake, the land was 60 cm higher. 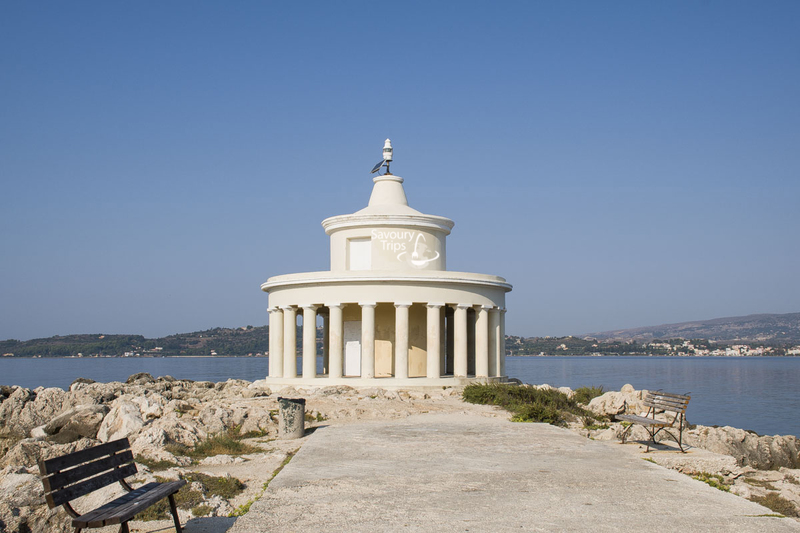 We’ve now crossed to Paliki peninsula where this, second in size city in Kefalonia, is. 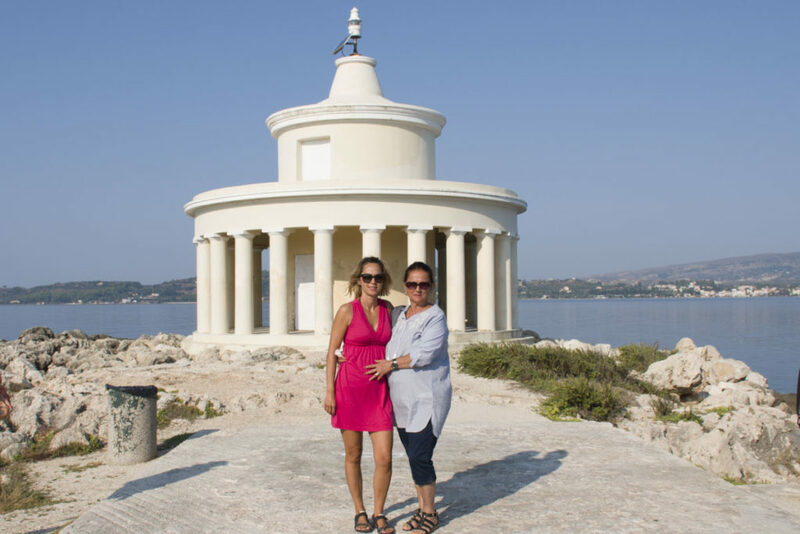 You can get to this city directly by taking a ferry from Argostoli, and the ride lasts for approximately 20 minutes. 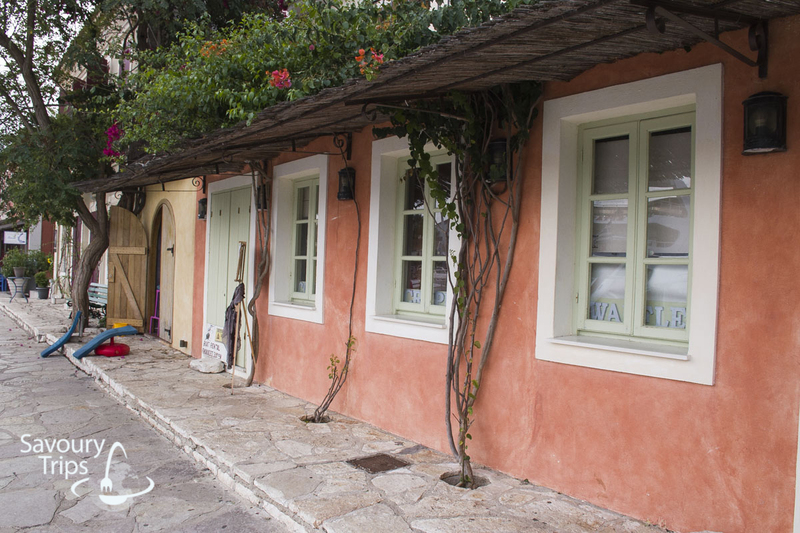 Also known as the Ionian Sea veranda. It is on the cliff above the sea and it looks like the world ends there. Unfortunately, I couldn’t get into the monastery because it was closed on that day for some reason, but we peeked through gate and fence like all curious tourist. Through the central part of the island to the east coast. 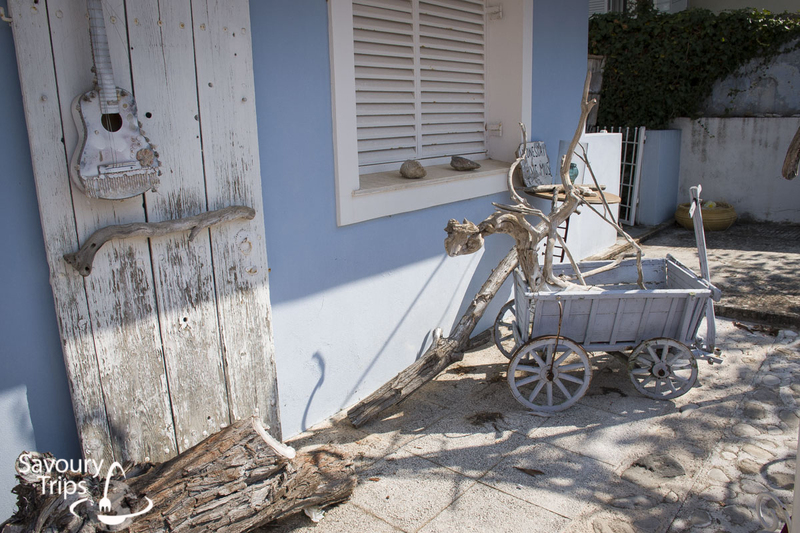 The original Lefkada capital which today is nothing but ruins. It is not reconstructed, but you can walk through and around it. The parts of the path are a bit slippery, so you should be careful about it. The view from the fortress on the villages beneath it. 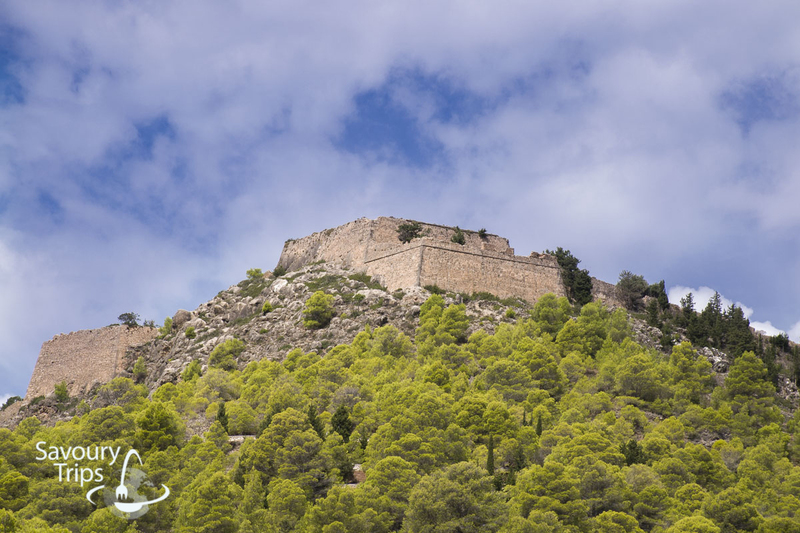 Next to the fortress, there is Castro village which has very unique architecture. 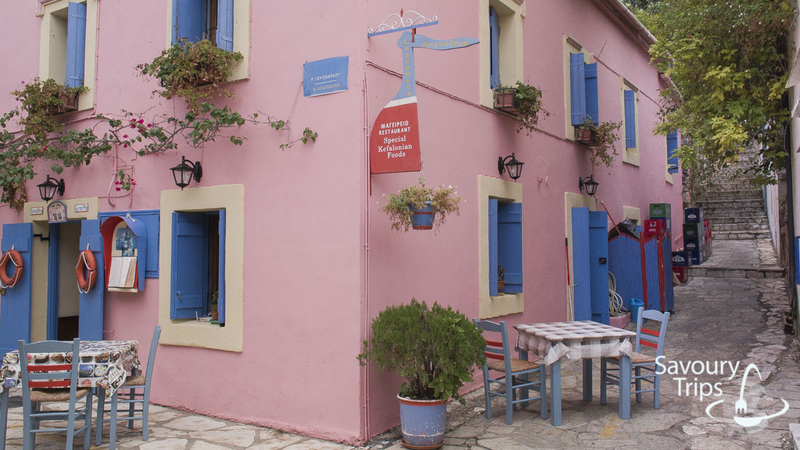 English influence is stronger in Kefalonia than in the other islands. The village of Castro has become familiar to me by great cakes, but the story about that is going to be a surprise. 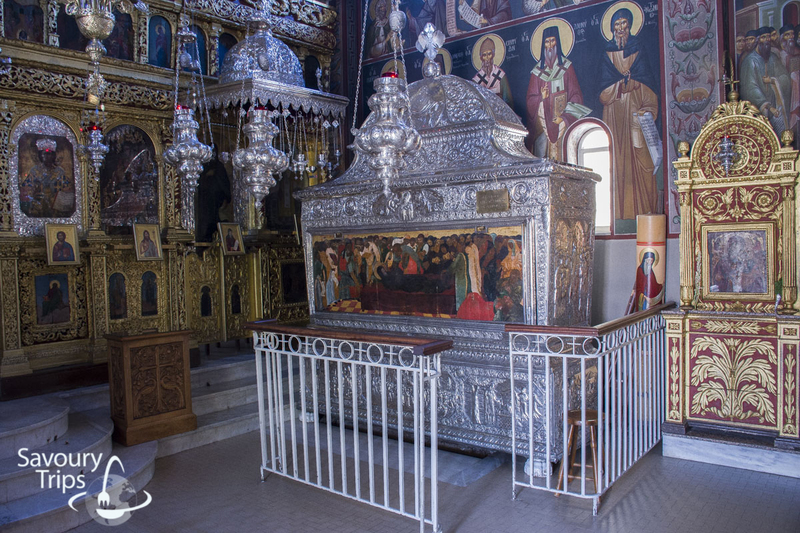 Dedicated to Gerassimos, saint, miracle worker and protector of Kefalonia. It is known that St. Gerassimos helped mentally ill people and that it why people loved and respected him. The monastery yard and buildings. Interior of the main monastery building. 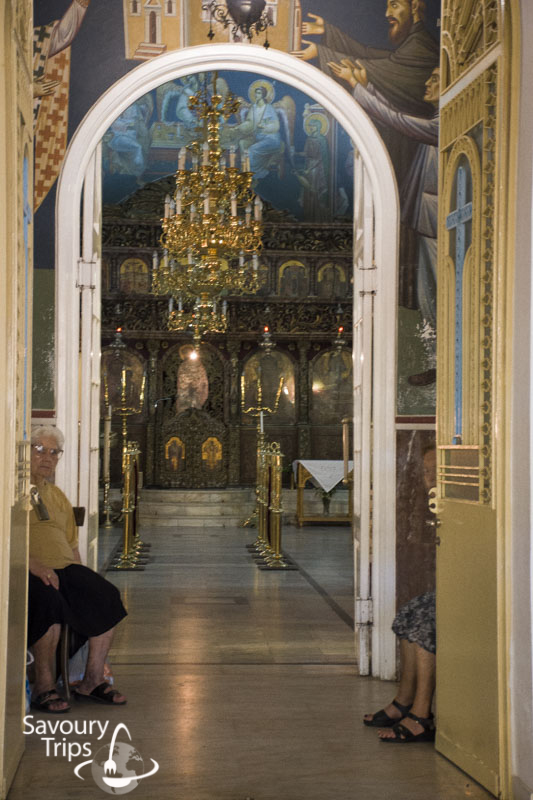 There is a cave in which St. Gerassimos spent time within the monastery. The entrance to the cave doesn’t look promising, there are steep ladders leading into it, so you should be careful. Personally, I couldn’t get down, although, as you can see, there were some braver than me. 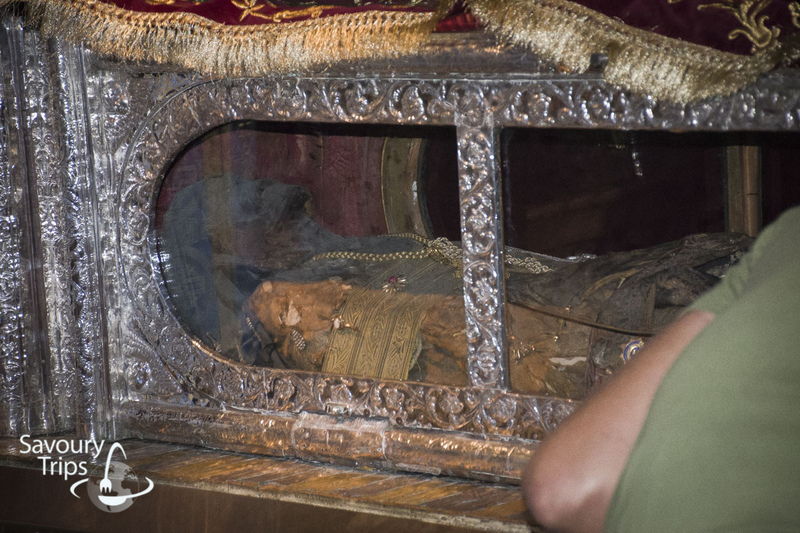 St. Gerassimos’ relics are also placed within the monastery. You can even see them. 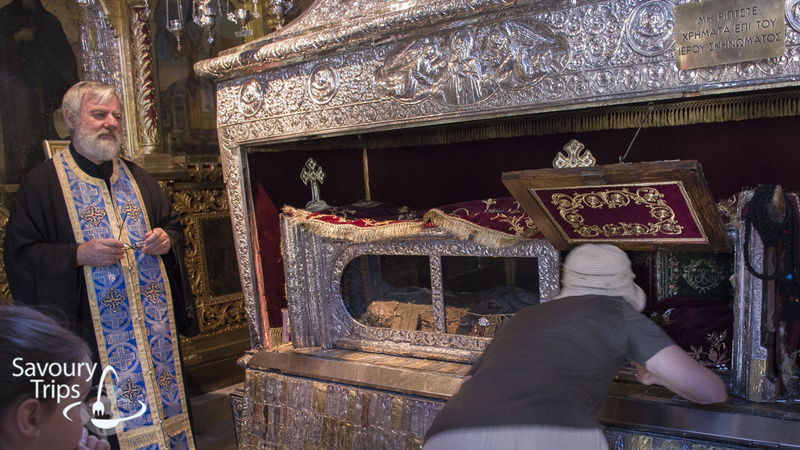 For example, if you visit the monastery on Sundays, the chances are you will be able to kiss the relics. It looks kind of scary, but still, it is worth seeing it. 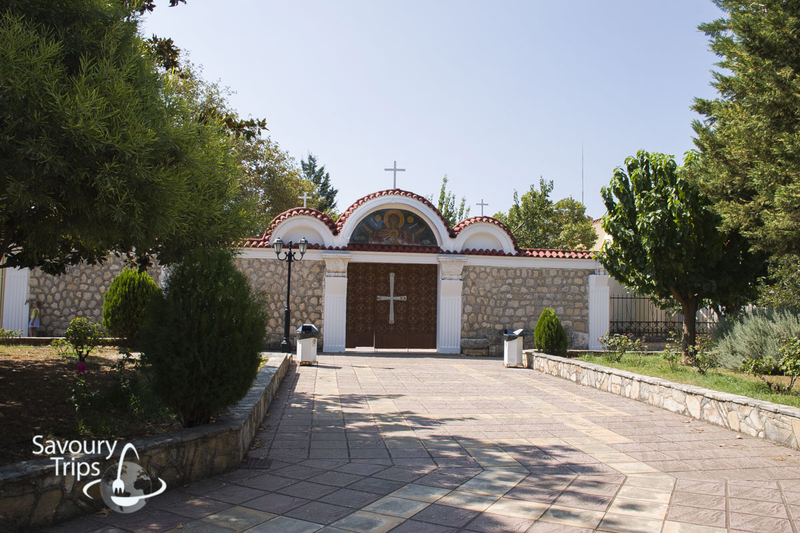 It is only 500 meters away from the St. Gerassimos’ monastery. 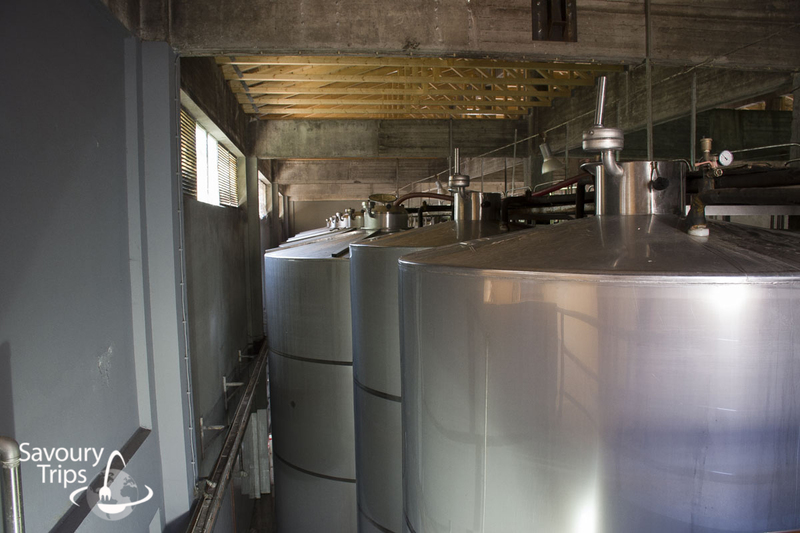 It is the best known Kefalonia winery and its famous brand. 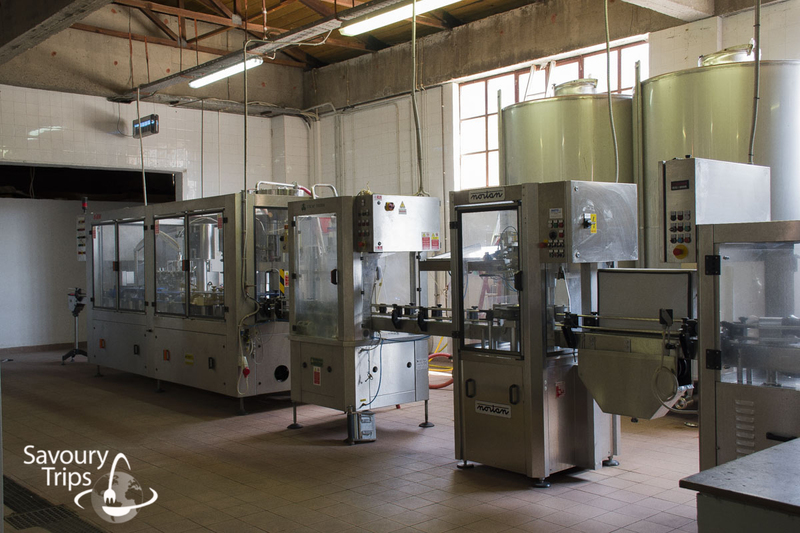 If you’ve decided to visit the factory, you can certainly do so, and buy some of the products at very good price. 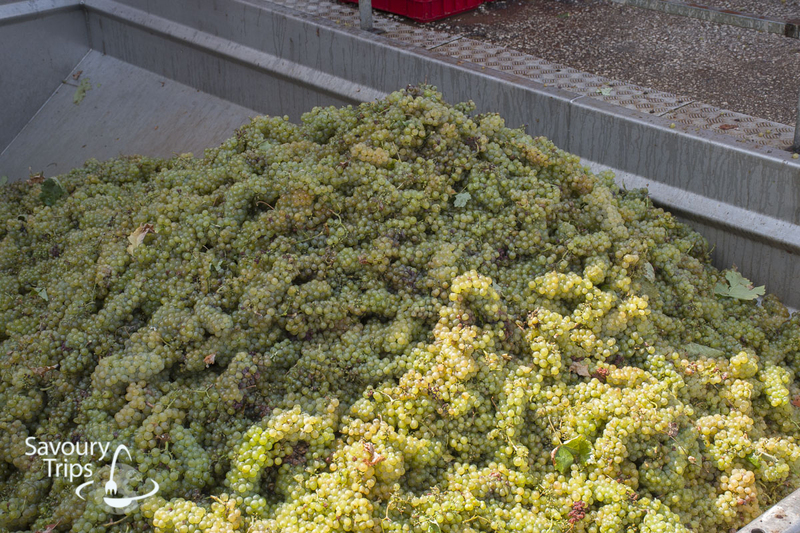 Robola Winery is famous for its white wine. 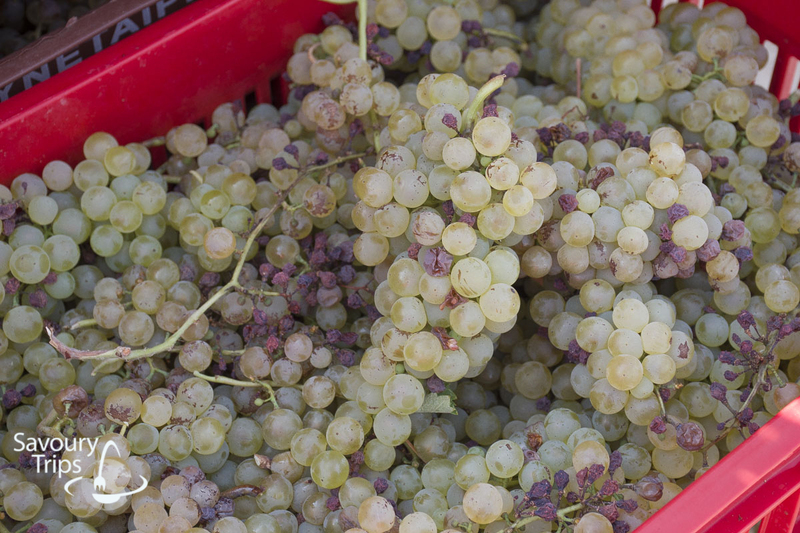 Be sure to taste them, at least when you’re visiting the winery. On the way to Sami, there is this cave as well. 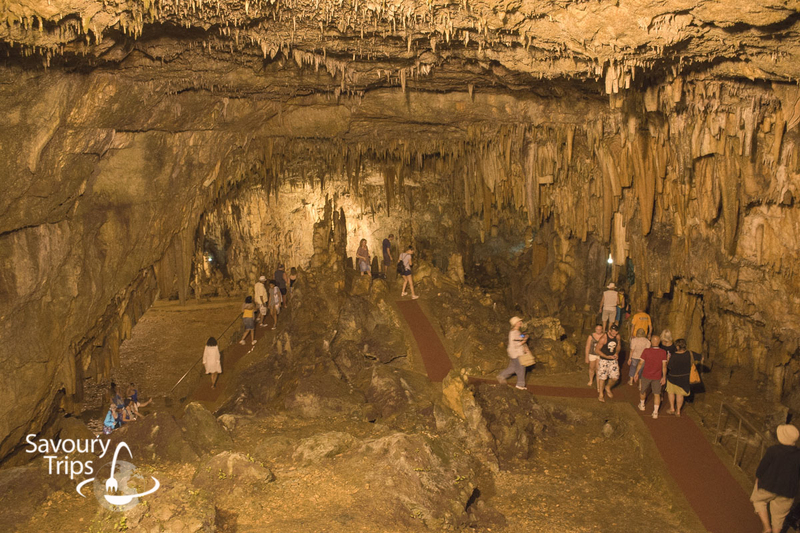 In case you are very sensitive to cold, be sure to bring something to wear because the temperature in the cave is 18°C. 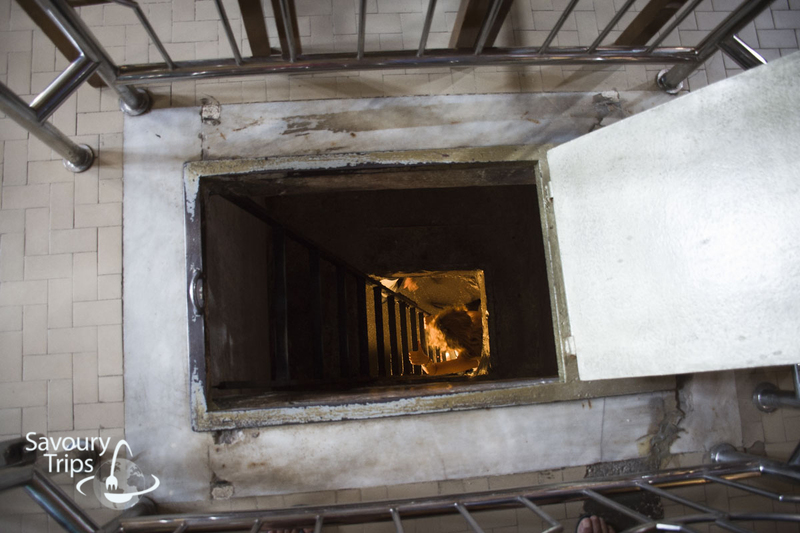 What you should also be prepared for is 200 stairs, 100 to the first cave chamber and another 100 stairs to the second one. Cave chambers are very acoustic, so they were used for opera concerts. 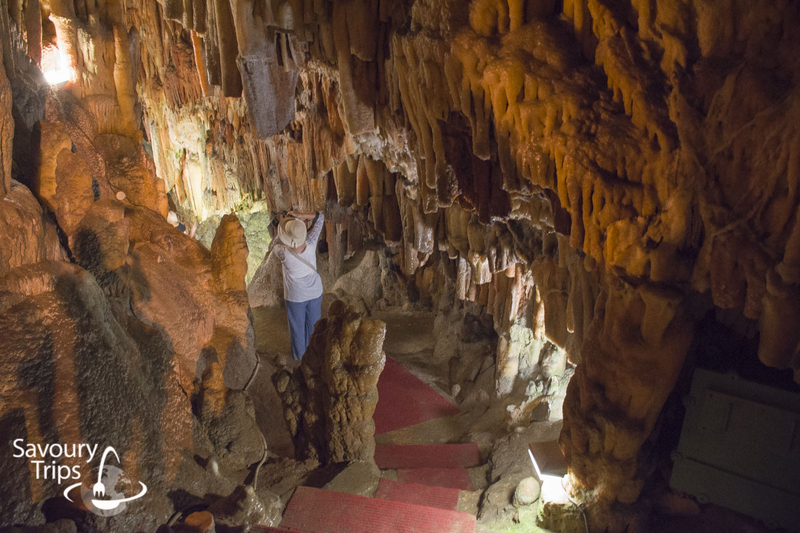 The best known Greek opera singer, Maria Callas, sang in the Drogarati cave. We decided to head towards Sami after the cave. The biggest harbor in Kefalonia where all main ferries arrive and depart from. 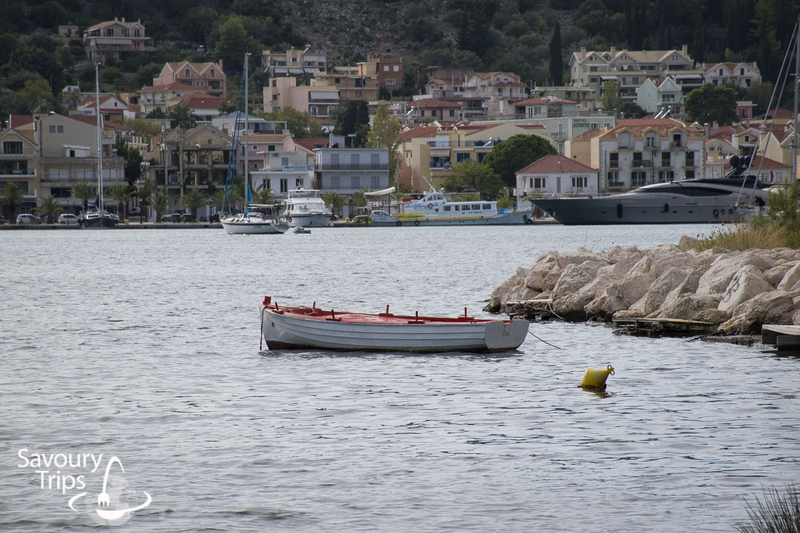 There is another harbor in Poros apart from this one. 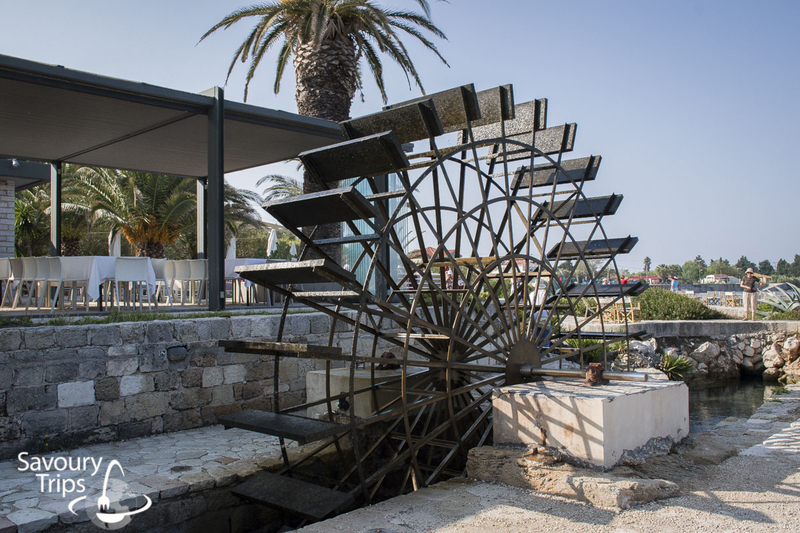 There are a lot of restaurants along the shore where you can enjoy some traditional Greek dishes. Captain Cornelius Mandolin movie was filmed there. Whether you were watching? 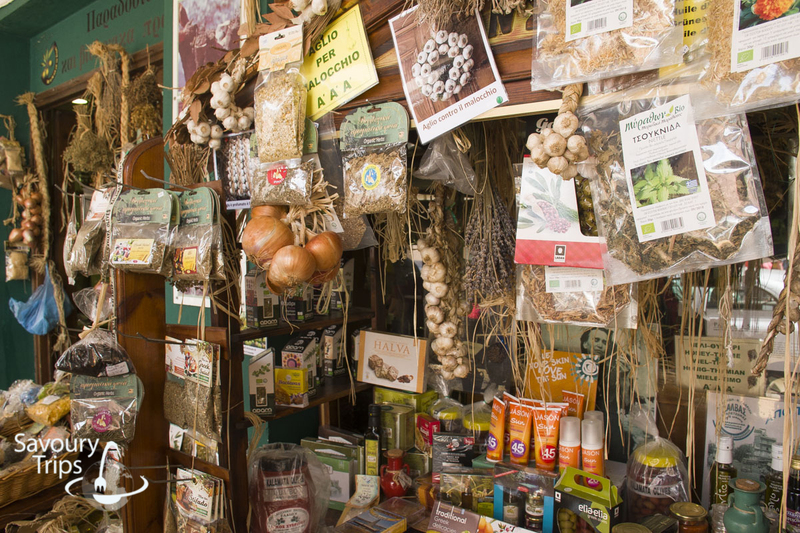 The streets are full of souvenir shops and little shops with healthy ingredients, food, and other things. 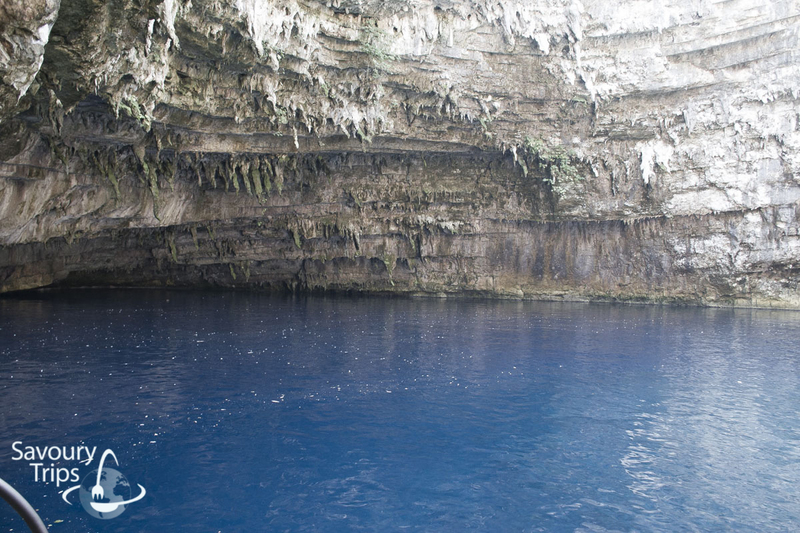 We returned to Karavomilos and Melissani Lake after Sami. 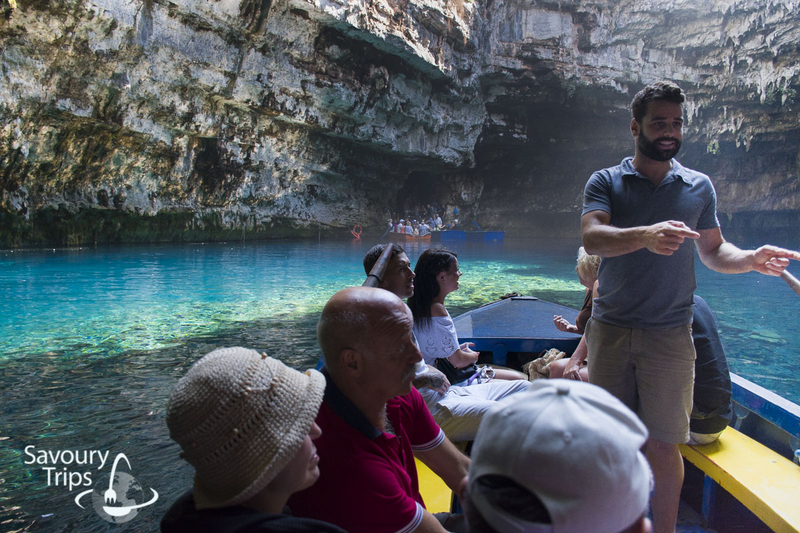 For me, the best experience in Kefalonia was the tour of the cave and the Melissani Lake. The lake has surreal bluish and green color. I am going to share most of the photos with you here because they can make a stronger impression than words, and depict the incredible view. 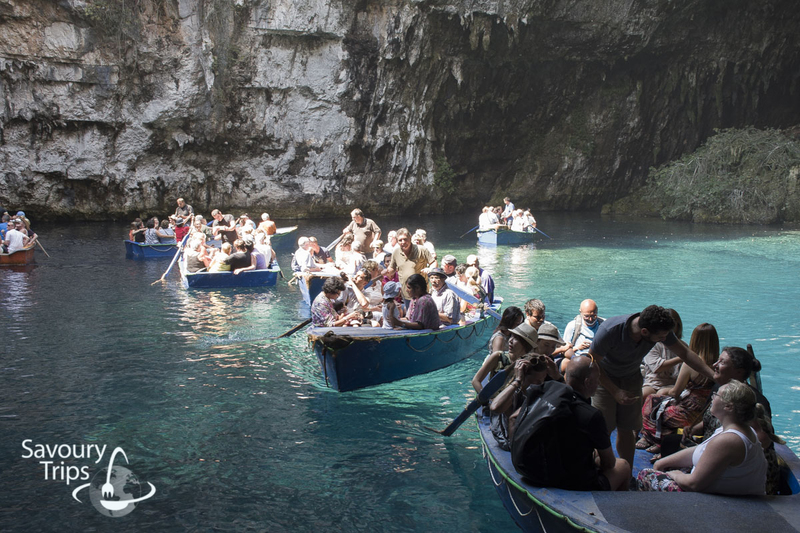 After a strong earthquake which hit Kefalonia in 1953, Melissani Lake is no longer a cave. The roof fell worn, the earth opened so that there is now an opening above the lake. 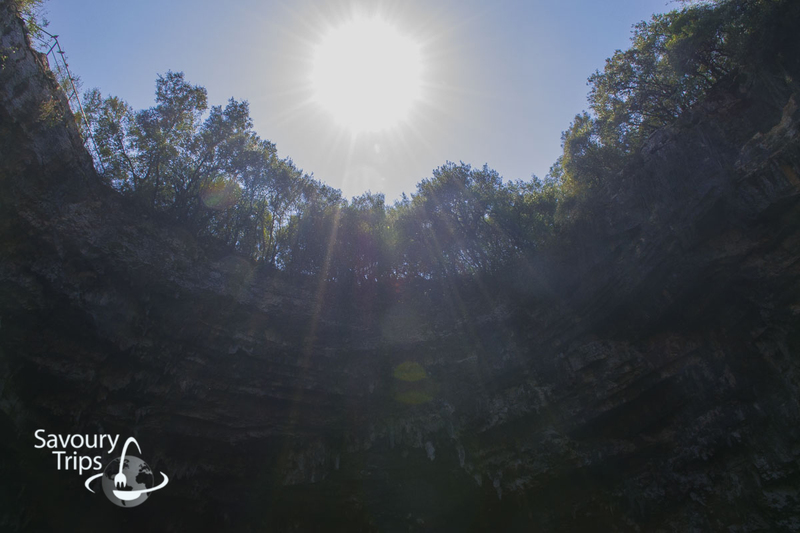 Hence, there is strong sunlight shining on the Lake Melissani during the warm summer days. The Lake has a lot of visitor during the summer season, so prepare to be patient because you will wait for your boat for a while, although there are at least ten of them. 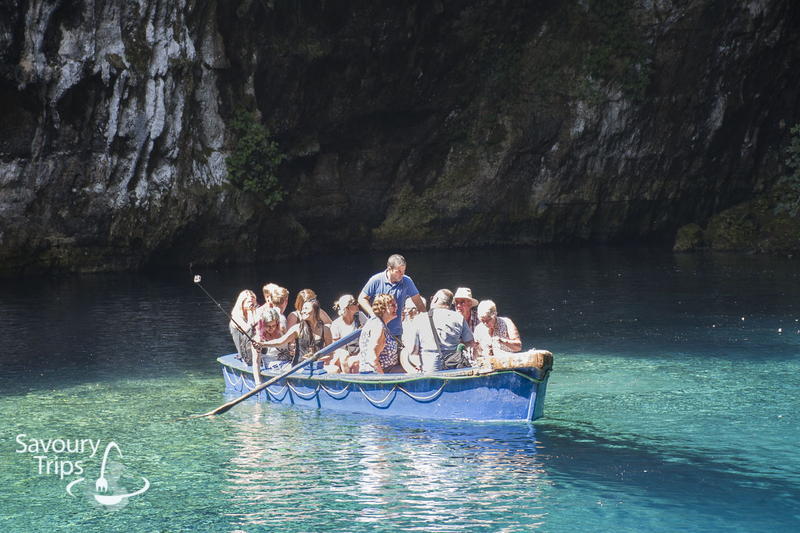 We heard a legend about how the Lake Melissani got its name on that occasion. According to this legend, there was a shepherd named Melisante who was in love with a boy from the town of Sami. However, that love was unrequited, and that was why she decided to drown in the lake. South of the island. This is when we spent most time swimming and drinking coffee. 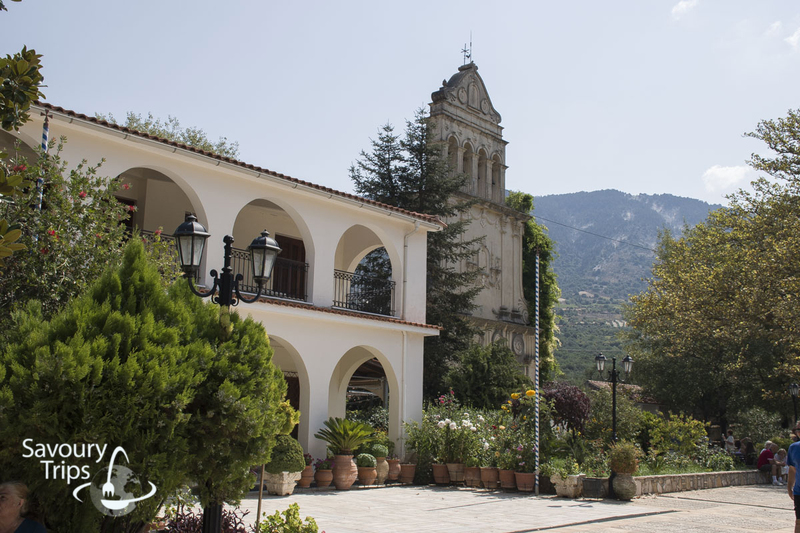 On the way from Lassi to Lourdata, you can stop by a village Metaxata, Kourkoumelata, and even Svornata. Those are all small villages, where the English influence is very noticeable. 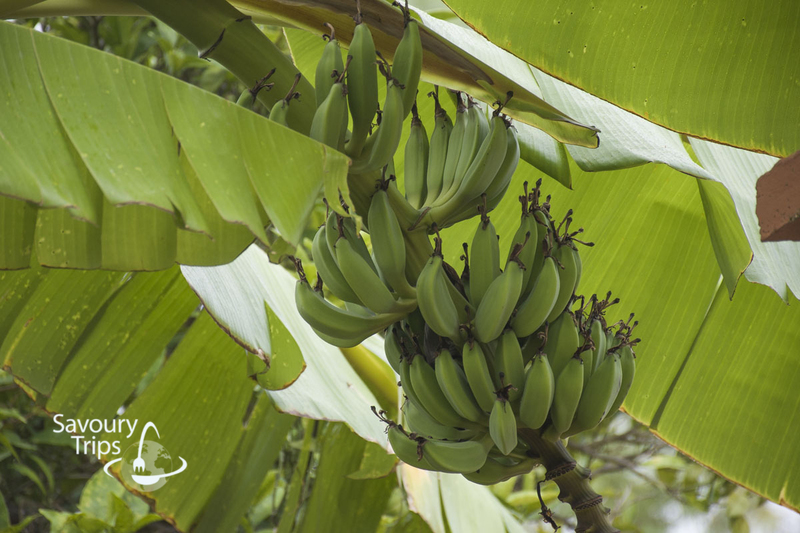 In case you didn’t know what Kefalonia bananas looked like, now is the chance to see them 🙂 . Beautifully decorated houses and even prettier back yards. 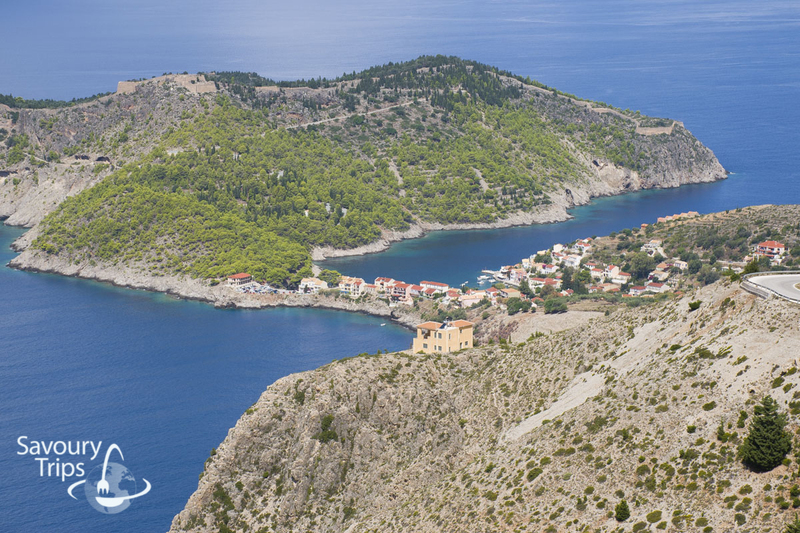 You couldn’t even guess Lord Byron loved visiting Kefalonia. Remember Lord Byron from the post about the Chillon castle? 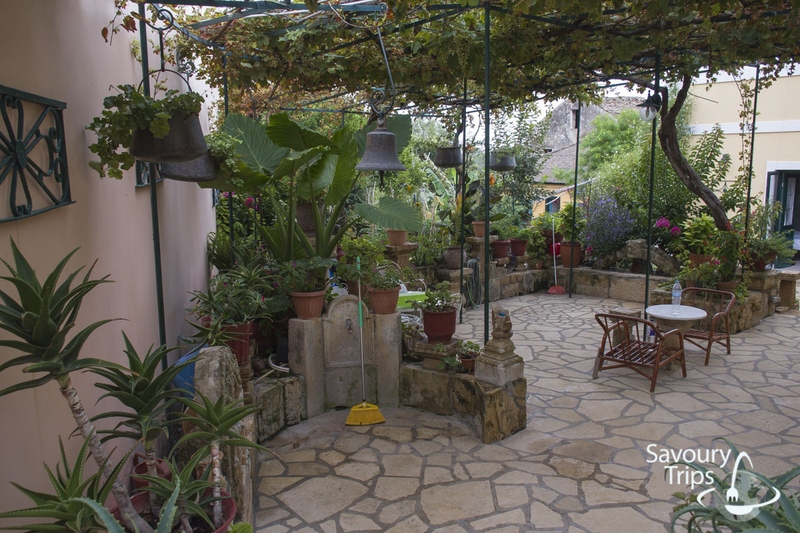 There is even a garden made in his memory. This is Lord Byron and me. 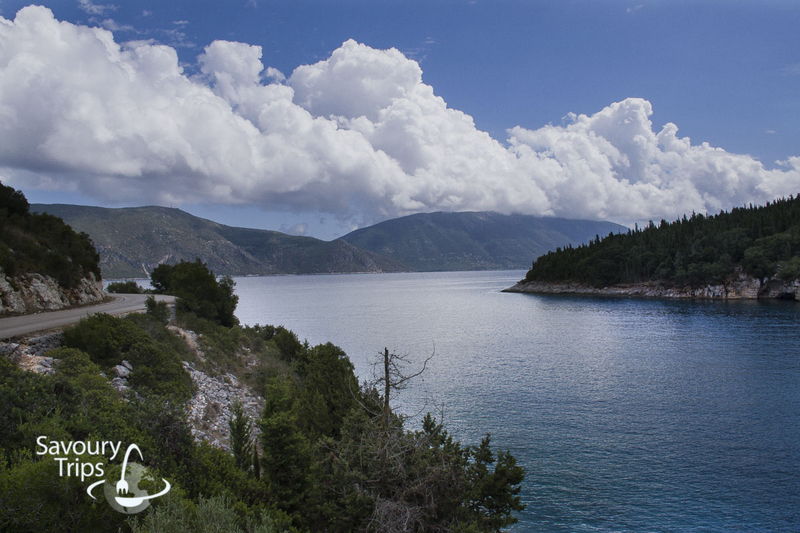 Farther from Lourdata, all the way to Poros, there are mostly beaches you shouldn’t fail to see. They are all long and sandy, but I am going to write more about it in the following post. Skala is for me one of the accommodation options. Most of the holiday houses and hotels are along the beach, meaning that the beach is right in front across the street. There are both sandy, and beaches with small pebbles in that region. If you are worried about the size of the pebbles, I am just going to say that it’s not a problem to walk barefoot. 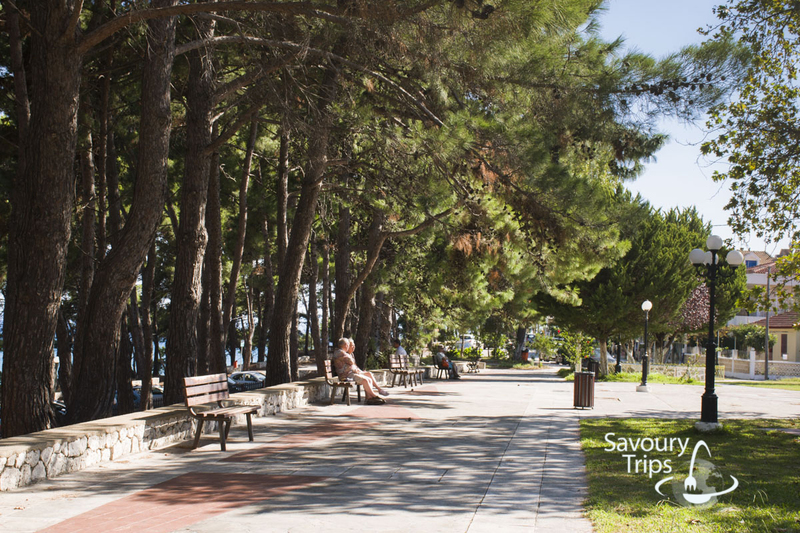 There are a lot of restaurants along the promenade, as well as some shops so that you’re going to be completely satisfied. 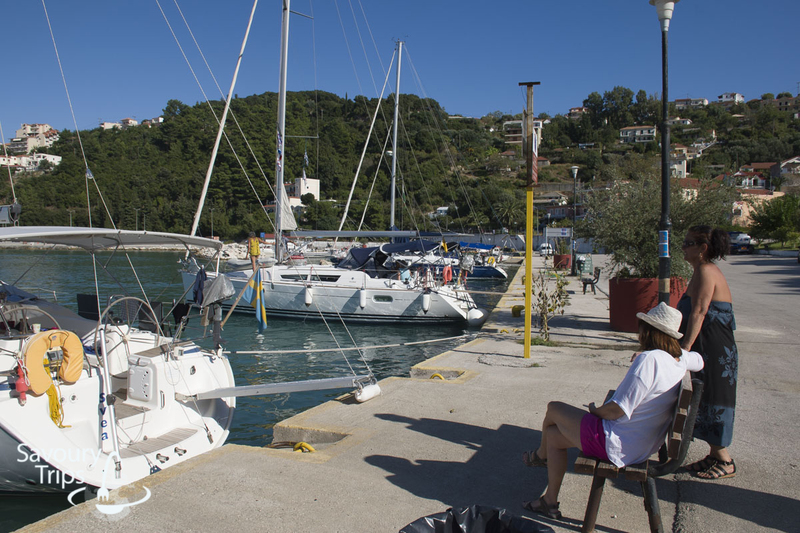 Poros is second in significance harbor in Kefalonia. However, although it is such an important spot in Kefalonian map, it is not so populated. 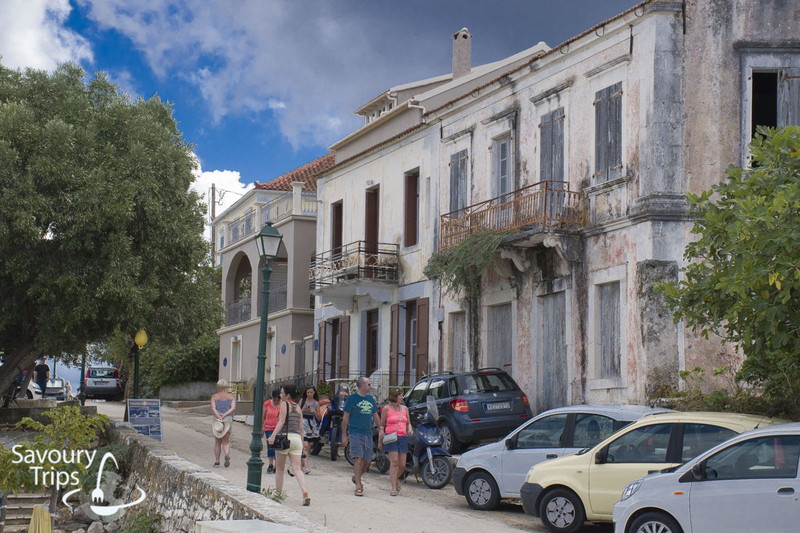 What I was disappointed with was that there are lots of abandoned building in the center of Poros. That is also a place for sailors, you can get your spot in the marine, drinking water, go to the nearby shop to get some food, and you can even charge the electricity in some spots. That is also a place for sailors, you can get your spot in the marine, drinking water, go to the nearby shop to get some food, and you can even charge the electricity in some spots. I remember Poros by some great pancakes, ice cream, and waffles. 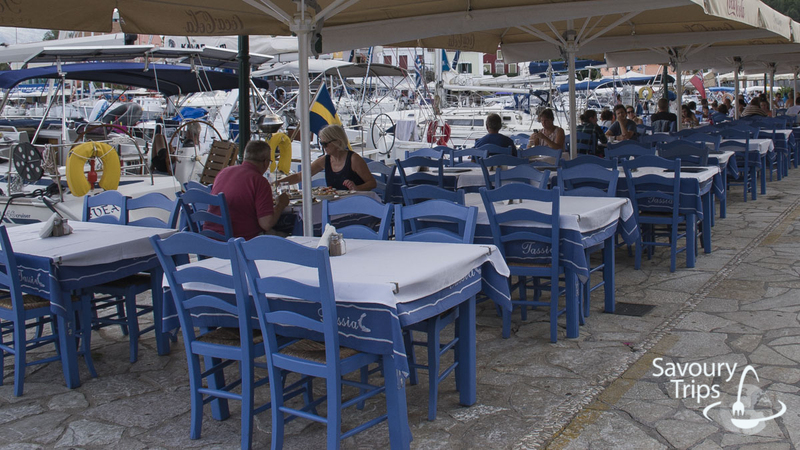 However, there is also some great gyros and souvlaki in traditional Greek restaurants with checked tablecloths. 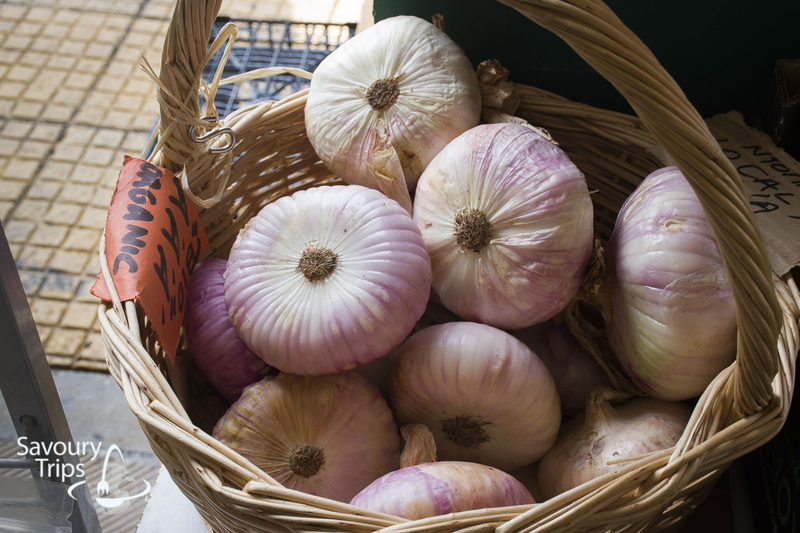 But, we are going to discuss food in Kefalonia in some of the following posts. 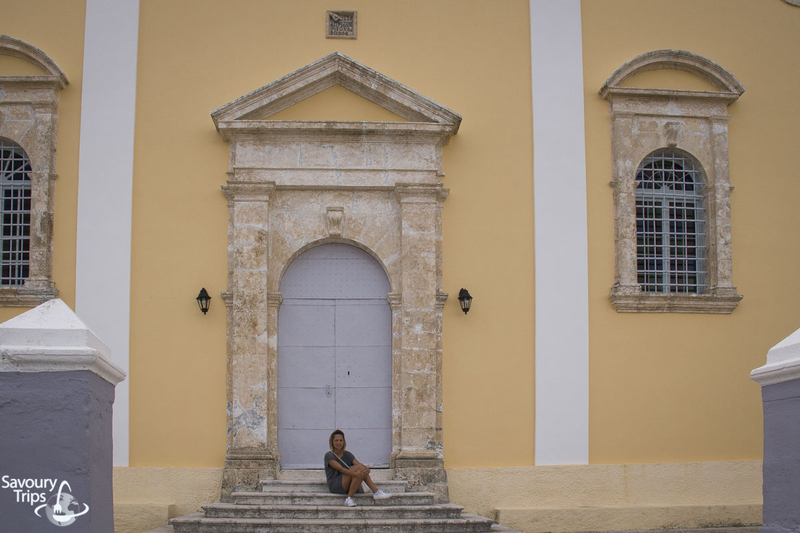 There are two options when traveling to the north of the island if you’re going from Lassi. One is through Argostoli and Farsa, and then towards Myrtos, i.e. Divarata. Another option is not to travel by Farsa, but to turn north earlier through Davgata and then to Divarata. 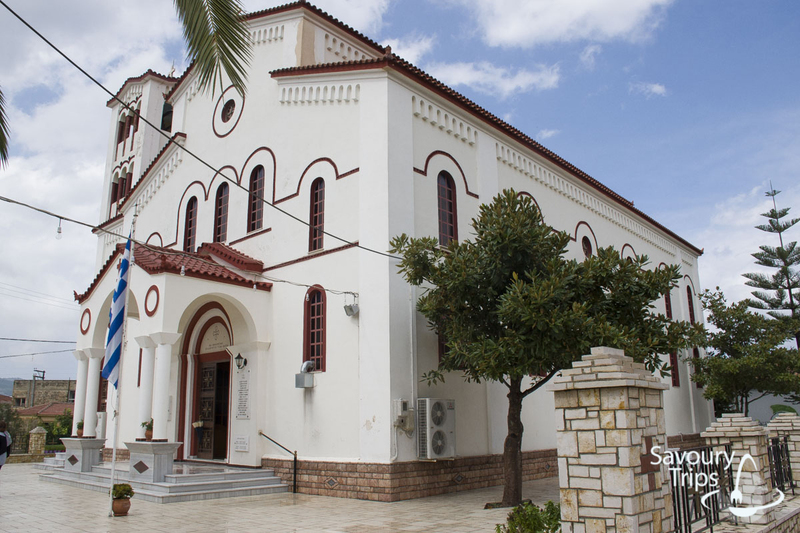 If you’re traveling from Skala, Poros, and Sami, and coming to Ag. Efimia, then your turning point is also Divertata. On the way north, there is the famous Myrtos beach, but more about it later. 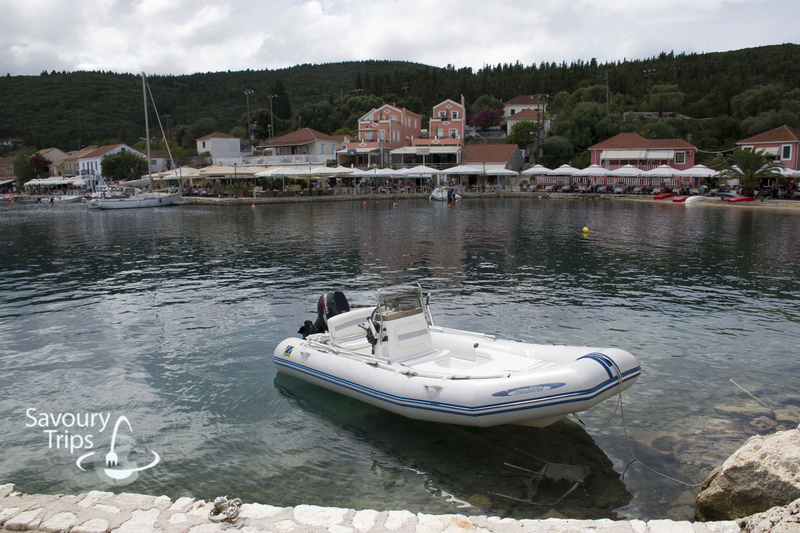 It is a two-hour ride from Lassi to Fiskardo, approx. 60 kilometers. My route was from Lassi, first to Fiskardo and then, on the way back to Asos and Myrtos beach, and then home. 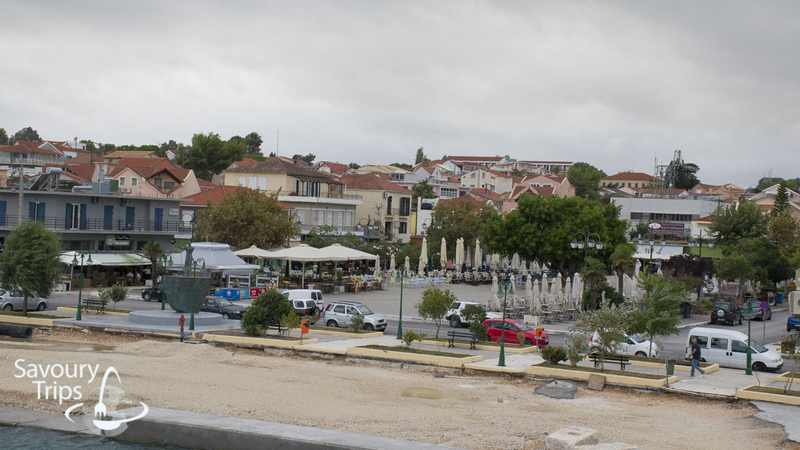 On that way back, if you’re still in the mood, you can also visit Argostoli, which we did. 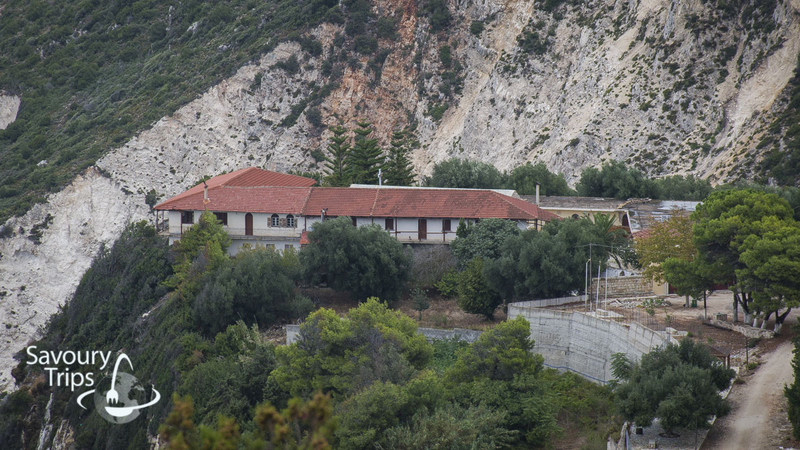 The most expensive town in Kefalonia. A place where sailors and all who love sailing stop by. 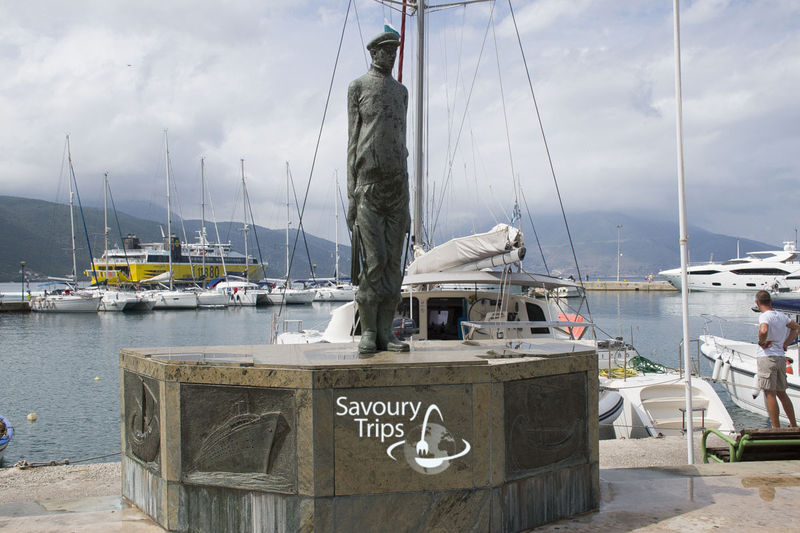 Place in which all ancient ferries from Lefkada and Ithaka anchor, filled with tourist. 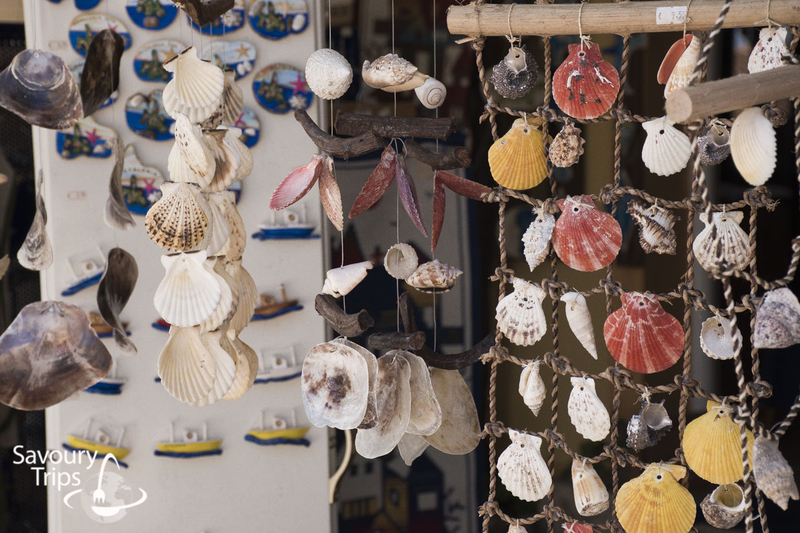 A great number of souvenir shops, pastries and merchant shops which can be found in this town. There are also some of the best equipped nautical shops for all sailing lovers. You are here to see, and to be seen. On our way back, we made a pause in Asos. 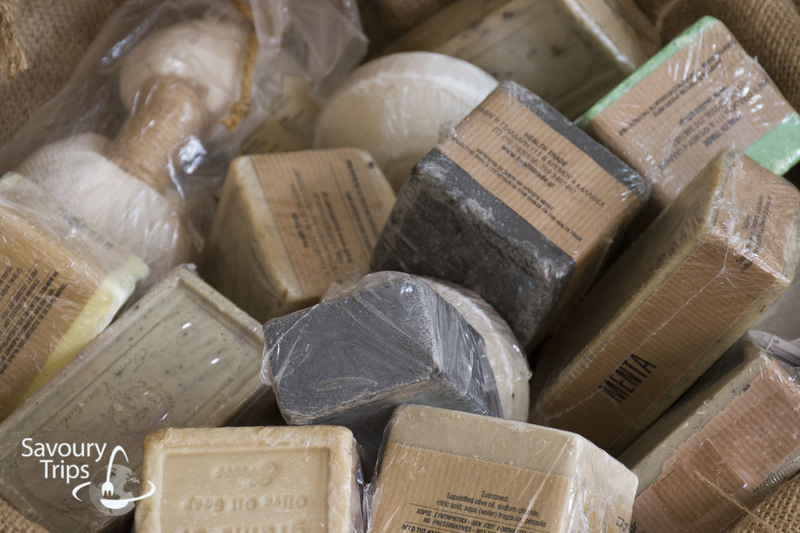 Asos is in the middle, look at the picture. 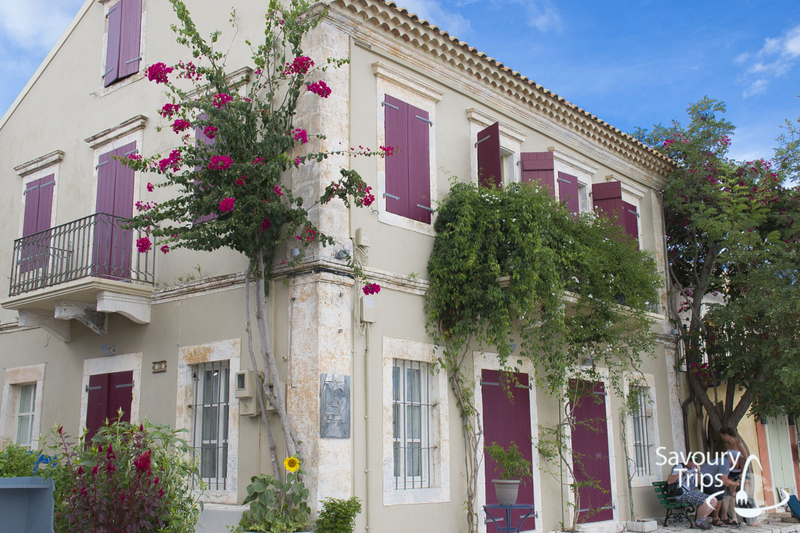 A beautiful village with traditional Greek-Mediterranean architecture. Asos shore is mostly rocky, but there is also a small beach where you can go for a quick swim if you can’t handle the heat. 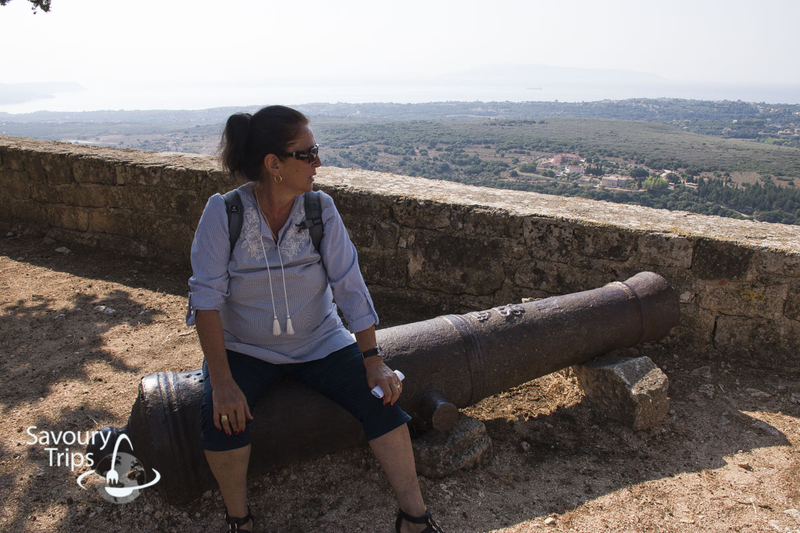 On the peninsula, there is second largest fort build as an offensive mechanism in some historical times. You can walk around the fortress, and there is a nicely decorated park which I would recommend if you’ve already come this far. After Asos, you should visit some of the beaches. 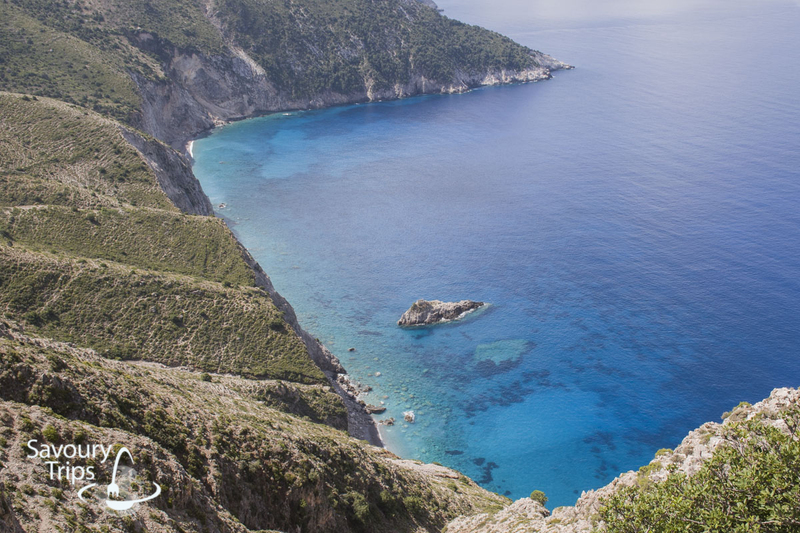 For example, you can visit Myrtos, the best beach for swimming. Afterward, you can head home. Ko bi rekao da toliko ima da se vidi. Vec mi je Kefalonija preporucena. Al nekako uvek odem na neku drugu stranu. What a beautiful trip! The ghost village would be so interesting to visit, did you explore it or only saw it from afar? You can go there of course, by foot. But nothing except the old ruined houses you can see. This looks beautiful! We loved Greece, especially the delicious gyros. 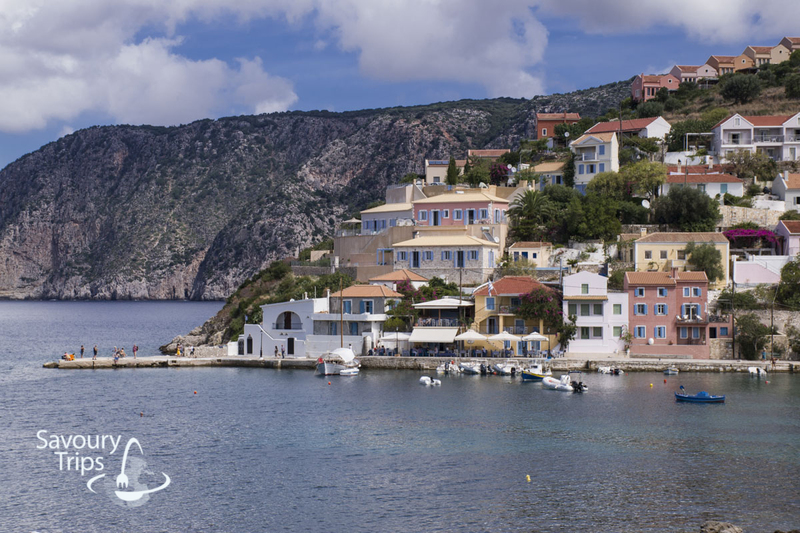 I had never heard of Kefalonia before! It certainly looks like a beautiful destination with plenty of things to do. I would love to visit the romantic lighthouse and take a boat ride. The places look stunning! Will put this on my bucket list in Greece! 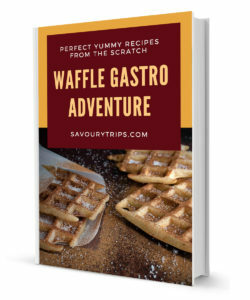 A great guide for the place. The pictures look awesome.. This is such a detailed post! Loved your writing and all the pictures. I am planning to visit Greece this year and glad I came across this post of yours. Looks like you had a blast! This place seems to have a lot of history and old culture. Would love to visit.